Ex-New Mexico Gov. 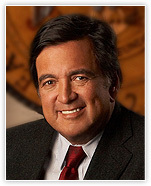 Bill Richardson is in for some nail biting. The Albuquerque Journal reports that a fed grand jury in Albuquerque is looking into possible financial irregularities in Richardson’s failed presidential campaign. The paper reported that a number of witnesses have been granted immunity. The paper reported that the feds are looking into whether campaign funds were improperly used to settle a “threatened lawsuit” against Richardson in the fall of 2007 by a former state government worker. Posted: 11/17/11 at 6:09 AM under News Story.